The contest for a free beauty product is coming to an end in about a week, so get those entries in! 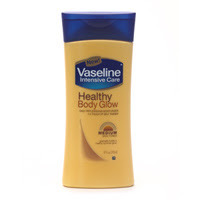 The product I have decided on giving away is Vaseline Healthy Body Glow. I have been testing this product for a few weeks and the review should be coming soon. :) To win this product, send an email to me at ideasfromlivy@yahoo.com and tell me your favorite beauty product. Hurry hurry! Ooo, this looks like it would work. I love their products. Oh also in the beauty buyable there is a sample of Nivea Soft Creme! It works very well! Just thought you would like to know. I could do a post on it if you would like!